The following uses a sample of 3147 3-bed Dublin properties. I expect lots of noise in this data. The average number of 3-beds in the sample is 77/month, but number for Jan-May 2014 are only 36, 64, 48, 63, 51 respectively. However, they arguably agree with Mantissa’s mix-unaware analysis. So the gap between asking and achieved troughed at about -15% in 2012 and most recently is up to +7%. The non-zero axes magnify this effect. Are you removing outliers? Is there any need? What % of the ads for 3-beds are you subsequently able to match to PPR entries, i.e. how complete do you think your coverage is? For those not following the Great Index Debates, this is probably the best piece of analysis of Dublin 3-bed prices done by anyone, ever, across any medium (assuming it’s correct and I see no reason to doubt ps’s work). Puts MyHome/Daft/CSO to shame. What is the average asking price over the whole time? It looks like the asking price and selling has generally moved closer together over the period which is interesting. With the PPR data being available, this is what I would expect. w.r.t asking prices, this is presumably last asking price. Which isn’t as useful as might be expected if you’re looking at a house for sale, since you cannot know whether it will be re-listed higher or lower before it’s eventual sale. The last 7 months have been bubblicious compared to the previous 24 months but have the CSO being reporting rises for much longer. If you wish it, it will come true!! whats with the sale price way above asking in the last month? Would be interesting to get the data points so we can plot vs CSO, sunspots, etc. PS, would you be willing to post that in spreadsheet form? What is your definition of Dublin? I would certainly expect robust discussion from someone such as yourself on the Daft.ie RPPR analysis, and indeed all house price analysis, but I wouldn’t expect you to ignore that it exists. If the data are correct, then we can see that sale prices only matched and exceeded asking prices around the time the market hype suggesting shortage of supply started to be ratcheted up by the EA’s again. The question is … which led to which? Ronan, would you care to link to your analysis of Dublin 3-beds? I have never seen such a thing and would be interested to read it. I’m going to say No. The standard deviations on price and on ratio of sale price to asking are not vast. Your question prompted me to look at extreme outliers – there were two properties where sale price was 4% and 5% of asking, both from 2011 and clearly spurious. I haven’t fixed this but won’t make a vast difference to results. As you know, the only way to match the PPR and myhome data is by address. Matching addresses without house numbers is pointless, so I discard everything without one. I attempt some automated cleanup and standardisation on the addresses before matching, but the hit rate is poor. I have 630k myhome records, for 134k unique addresses of which 76k have house numbers. I only managed to match 12k of these against the PPR and when I limit it to houses for sale without any special conditions and with the PPR full price flag, it drops to under 11k. 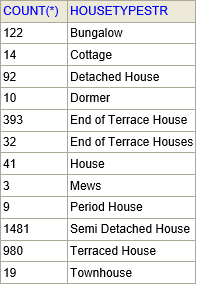 So the final match rate even after selecting only properties with house numbers is a measly one in seven. The average asking for Dublin 3-bed houses in the period from Jan-2011 is €275,800. The average selling price is €251,100. I don’t think the PPR has done that. While prices were falling, selling prices were below asking. When prices stabilised/rose selling was above asking. Probably the same in any market. w.r.t asking prices, this is presumably last asking price. Which isn’t as useful as might be expected if you’re looking at a house for sale, since you cannot know whether it will be re-listed higher or lower before it’s eventual sale. It’s both better and worse than that. I have all the asking prices from my snapshots, so if I see a property more than once I have the data. But a) it’s not easy to decide what to do with multiple prices, b) I only have 3-monthly snapshots so very coarse granularity. So, as you surmise, I’m using the latest price seen. It’s based on 51 individual matches. Scanning the raw data by eye I don’t see anything obviously spurious. It’s just that there are a lot of them going above asking. The breakdown of the ratio of selling to asking is: under 90% - 5, 90-100% - 9, 100-110% - 20, 110-120% - 7, 120-130% - 5, 130-140% - 3, 140-150% - 2. You (or anyone) are welcome to the data. The format is twisty, though, and has multiple encoded fields for things like house type, sale type, tax type, price type etc. It makes much more sense as a relational database where it can be simplified using views. I suspect you’re probably comfortable using an RDBMS. I’m using the open source H2 database which takes about 5 minutes to download, install, and get running. I could give you the data as a H2 database along with some illustrative sample queries. Can also do it in CSV format, but will have to be three separate tables and you will be on your own trying to join them. H2 has good facilities for importing and exporting csv data, which allows the raw data or the results of queries to be exported for massaging in spreadsheets etc. You (or anyone) are welcome to the data. The format is twisty, though, and has multiple encoded fields for things like house type, sale type, tax type, price type etc. It makes much more sense as a relational database where it can be simplified using views. I suspect you’re probably comfortable using an RDBMS. I’m using the open source H2 database which takes about 5 minutes to download, install, and get running. I could give you the data as a H2 database along with some illustrative sample queries. Can also do it in CSV format, but will have to three separate tables and you will be on your own trying to join them. PS, thanks but I wasn’t even talking about the raw data; I just meant the two resulting data series charted in your graph above. Thanks again for this analysis. However, slicing it even more ways than I did would result in very small samples. Same again, for Dublin 4-beds. Sample sizes here are quite low, only 25 for that spike in Aug-13 and only 15 for May-14 so far, mostly around 50-60/month elsewhere. Total sample 1,599 4-bed Dublin houses. Interesting that average selling price has never overtaken average asking on 4-beds (apart from maybe last month). I thought that market was hotter than 3-beds, from anecdotal comments. I guess the moral is don’t get caught in a bidding war on a 4-bed. Trojan work pa, fair play to you.